Two IMG-managed golf clubs have been honoured at the World Golf Awards. At the La Manga Club in Spain, Garden City Golf Club in Phnom Penh was named as Best Course in Cambodia. Also managed by IMG, Ba Na Hills Golf Club in Danang, designed by Luke Donald in association with IMG, won Best Course in Vietnam. For good measure, Ba Na Hills was also awarded the prize as ‘Best Course in Asia’ for the second year running. Meanwhile at the Asian Golf Awards, IMG Golf Course Design was first runner up in the Best Golf Course Architect in Asia Pacific category. 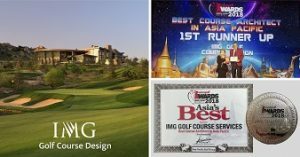 “It’s a real honour to have courses we designed win these awards and is a great credit to our team and fantastic partners,” said Paul Burley, Senior Vice President, IMG Golf Course Services, an Executive Member of the Asian Golf Industry Federation. “IMG is very proud of our design portfolio and we work hard to provide our clients with exceptional levels of service, and innovative design solutions.